It's a great speaker, especially for the price. Sorry, but I have nothing bad to say. Build quality, great piano finish tops and bottoms, horn sounds great with jazz and movies, couldn't imagine a better center for under $200 let alone under $150! Just purchased an acousticsounddesign HT-65 center channel from acoustic sounddesign.com. They were quick to ship the item and the center was new as described, not a refurb, and in the original packaging. Acousticsounddesign was very responsive to my emails and I will probably purchase the HT-75s from them as well. So what can I say about the HT-65 that hasn't already been said. I agree with the other reviewers about he treble and highs being a tad sizzling and blaring but am thinking that will go away after the break in period of 50 to 100 hours. The bass was slightly boomy but I fixed this through the internal x over in my HK AVR525 amp. The horn sounds great and the speaker sounds head over heels better than my previous center (JBL N Center II) . Not even a close comparison. For the money I would recommend acousticsounddesign and these acoustech speakers to an audio enthusiast or beginner like myself looking for a great sounding speaker at an affordable price. Seperation of voices and instruments. Efficient, do not need alot of power to run them. Very light weight if you are wall mounting them. Cabinets look great. Not built as solid as some better brands, but thats were the savings is. also immaging is just ok. Sound good at normal listening levels, but ( this is where Klipsch shines) they will not play real loud and still sound real good. Let me first say that I'm not a dealer or Audiofile. I just enjoy stereo equipment. It is my hobby when I can Afford it. I have owned many speakers in my past (back when I was making more money). Some examples are: Martin Logan -Request, Klipsch -Klipschorns, Carver -ALIII, M&K -many. I was shopping and researching getting Klipsch again and I had listened to the RF-7 and RC-7 a couple of years ago and really liked them. Well, I came across the Acoustechs while searching and got curious. I read some reviews and said "I must be crazy to try these if they are that cheap". I decided to start with the center(HT-65) and the bookshelfs(HT-64) because I wanted to mount them to the wall rather than have towers for my small room. My equipment is pretty good. I have a Lexicon DC-1, Rotel RB-985II, Toshiba DVD SD-9200, Tice line conditioner and Nordost cables. Listening to these before they even broke in, the first thing that amazed me was the seperation of voices and instruments. I could hear each singer, guitar, bass, drums, piano, etc. They were all very distinct and not at all like some speakers which will blend certain sounds or frequencys together. After letting them brake in. I did some real listening. First the voices sounded very clear and natural in music and even better in movies. second the three speakers blended very well together. the imaging was good but not great. I am about 90% movies and 10% 2-channel music. So these are perfect for what I need. Now don't get me wrong there are better speakers out there and I have owned some of them, but for very efficient and great sounding speakers for very little money is amazing. Last comment I'll say is even though I am a Klipsch fan, save the money and get these Acoustechs. You will not regret it. I will be getting the surrounds and Sub, to complete the system, very soon. I Give them 5 stars for the fact that you get a good sounding speaker for very little money. I am dealing with www.acousticsounddesign.com and luckily have not had to bother them with any problems, so I cannot really comment on them. That is a good thing. Klipsch, Martin Logan, Carver, Monsoon(horrible), Infinity, Sonus Faber, M&K(Excellent), Boston Acoustics, Energy, Monitor Audio, NHT, Paradigm. This center speaker is of nice build quality and it quite frankly blows away my much more expensive Nht center. This speaker has a very full loud sound. It really brought my system to life. Accuracy, clarity and lush mids. Sleek, slick, black piano lacquer finnish and my what a pleasure to hear. Highs and mids are lush and accurate. The speaker is very efficient and easy to drive. Your modestly powered receivers will not have any trouble driving any of the speakers in the Acoustech line. Acoustic Sound Design is the place to buy these speakers!! Sound Great - Look Great! 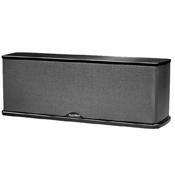 You can't go wrong with this center channel speaker. Its almost identical to the BIC dv-62-clr(s) except it has about a 3db volume increase and very slightly brighter. The new model with the piano black finish looks great. Plenty of headroom without distortion and just sounds great! Match up with the new Acoustech ht-64's fronts and you're all set except for the surrounds, The HT-62's should work well. Excellent speakers. I purchased from www.acousticsounddesigns.com which has a good price and service. Excellent Value. Great sounding speaker - and great looking. This is a great center channel at the right price. I purchased it from http://www.acousticsounddesign.com for $139 - a great value and comparable to the Klipsch Reference series based on everything I read. I did a lot of research and determined that the Acoustech line made the best sense for me, but I wanted to buy just the center channel to start - to see how it really sounded, and how well the on-line store performed. After listening to the speaker, I am very happy with my purchase. I also recieved the speaker from acousticsounddesign.com when expected. They made it a very easy buying experience and kept me informed every step of the way via email. I now plan to buy from them the Acoustech surrounds (HT-63) and fronts (HT-65), and will purchase the sub-woofer when funds permit. This was a great shopping experience and a great value. Excellent Value. Very good balance between lows, mids, and highs. Warm and comfortable timber and clean, tight highs. The two 6" woofers provide ample base. Base is a bit excessive in some scenes that include music. For example, the excessive drum base in the courtyard battle in Crouching Tiger almost overpowered the swift and crisp swordplay. Excellent value! I purchased from http://www.acousticsounddesign.com for $139. I listened to several center speakers -- including the Klipsch RC-35, RC-7, and the JBL Northridge E Series EC35 -- before purchasing the HT-65. I hadn't listened to the speaker before buying. My decision was based on very favorable reviews and comparisons to the Klipsch Reference speakers. Since the HT-65 is nearly $400 cheaper than the RC-7, it was worth the risk. Everyone looks for different qualities and signatures in speakers, but the timber quality in the HT-65 is crisp and comforting. The highs, to me, are more crisp than the RC-35 but not quite as clear as the RC-7. The 6" woofers provide ample (bordering on excessive) base. Overall, a very well-balanced speaker. In the waterfall scene of "Last of the Mohicans", the dialog is normally overpowered by the raging water. This made for an excellent test of the speakers lows, mids, and highs (how well balanced they are). Typically, the conversations are drowned out by the waterfall's excessive lows and snowy highs. With the HT-65, I could hear a low rumble as well as moderate, crisp highs from the waterfall. More importantly, I could really sense the urgency in Hawkeye's voice. This speaker provides very crisp and warm mids/highs. Bottom line, while not perfect, this speaker is worth every penny and is one of the best values around. You'd think these centers were $400 by their sound and finish. Acoustechs are a very good entry into full-spectrum home theater for those wanting to upgrade from HTIB systems and the like. Super smooth, low distortion High Efficiency They play loud! They're not as clear as the Klipsches but they are excellent refined performers for this price level. These are big and not really decor-friendly, though and are definitely for those who have good sized rooms where these can fit, or for those who don't really care. BIC Acoustech HT-65 I was thinking about getting all the Acoustechs except the sub but decided not to get the floors since they would have taken up too much space, so I got some Klipsch SB-2 bookshelves along with the Acoustech HT-65 center and HT-63 surrounds. I was even more glad that I didn't get the floors because this center channel is BIG, and looks big even on top of my 36" TV. The speaker was really well protected in the shipping box - cellophane film covering the gloss tops and bottoms so I thought it would be a good idea to put a thin rubber mat under the speakers to keep 'em from getting scratched. After that I was ready to give a listen and took out The Mask and put the system through its paces and after it was over I was really happy that I had found such good speakers which worked so well with the almost laid-back sound of the Klipsches. The dialog was clean and accurate with no upper-bass voice bloat and the highs were crisp and extended without harshness. Their was ample fullness and warmth in the lower registers as well. So I can say it was great to find a system that all worked pretty well together. The Acoustechs aren't anywhere near the ultimate in transparency or clarity but at these bargain prices it isn't really an issue, at least it isn't for me. To get more one needs to shell out mucho more big bucks. So these Acoustechs are really something to consider if price and quality are your main criteria for buying. I recommend also getting the HT-63 surrounds if you're getting the fronts or center-channel Acoustechs. They're balanced and very open sounding and of course your also getting good tonal matching. price and quality of sound. Great looking design. hi-gloss finish. nothing at the price is sells for.